The CPF board allows members to top up the CPF accounts for themselves or for their loved ones under the retirement sum topping-up scheme, subject to the recipient's top-up limits. You can do this through a monthly or yearly Giro deduction by setting aside an amount that you are comfortable with, even if it is just $100 a month. Mr Christopher Tan of Providend says: "You're putting more money into your retirement funds and can earn greater guaranteed interest." The topping-up scheme is again ideal, as it will place money in your Special Account - if you're below 55 - or directly into the Retirement Account for those 55 and older. • Start by being open about your own finances with your parents, says Mr Christopher Tan of Providend . "It won't help anyone if you're not realistic about your ability to help and the limits of what you can provide." • Ask your parents questions and try to be specific: When exactly do they plan to retire? Where do they plan to live when they retire? Mr Tan suggests asking if they plan to sell their home to downgrade to something more manageable, for instance. How do they plan to pass the time when they're retired? Do they plan to have a part-time job? If so, what kind and why? • Engage a trusted financial planner and get educated together. Find more information on the CPF website and special links like www.cpf-bigrchat.sg. • Stay involved, says Mr Tan. Check in on your parents regularly, "to not only keep the relationship going, but also help protect them from scams and fraud". You earn an interest rate of up to 5 per cent on these accounts, which is better than interest rates from banks. Explore more sources of income and remain employable, even if it's part-time work. Also look at other investments such as Singapore Savings Bonds, Reits, preferred shares or blue chips, but note the risk. Mr Tan points out that bonds are not always safe, as it depends on their credit-worthiness and foreign exchange exposure. Before investing towards your future and taking bigger risks, build a strong financial foundation. You should set aside at least six months of expenses in cash for an emergency, and can put this sum of money either in fixed deposits or the SSB. Buy a suitable hospitalisation and surgical insurance plan for you and your family, and a critical illness policy that pays a lump sum. If you have dependants, you may need to buy insurance to replace the loss of family income, or pay off the mortgage, in case you die. 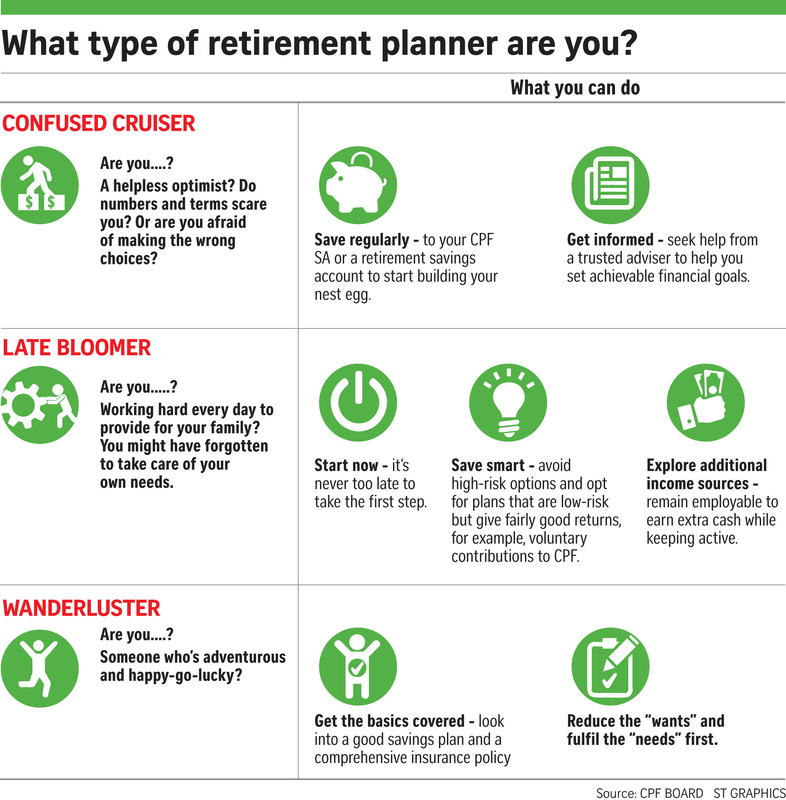 What type of retirement planner are you?